As many as 40 companies across the UAE have been awarded Dubai Quality Award (DQA), Dubai Human Development Award (DHDA) and Dubai Service Excellence Scheme (DSES) for their outstanding pursuit of excellence during 2017. Held under the patronage of His Highness Sheikh Mohammed bin Rashid Al Maktoum, Vice-President and Prime Minister of UAE and Ruler of Dubai; Sheikh Maktoum bin Mohammed bin Rashid Al Maktoum, Deputy Ruler of Dubai; and Sheikh Ahmed bin Mohammed bin Rashid Al Maktoum, Chairman of the Mohammed bin Rashid Al Maktoum Knowledge Foundation, attended the 24th annual Business Excellence Awards hosted by the Department of Economic Development (DED) in Dubai on Tuesday. Emirates Gas from the Manufacturing - Oil & Gas sector and Transguard Cash (Service sector) received the Dubai Quality Award 2017, while Fujairah Police General Headquarter (Government sector), The National Bank of Ras Al Khaimah (Finance sector), Aster Hospital - Mankhool Branch (Healthcare sector), Deyaar Owners Association Management (Service sector), Gulf Medical University (Education sector) and Global Green Bridge Contracting (Construction sector) received the Dubai Quality Appreciation Award. French Business Council (Dubai & Northern Emirates) also won the Dubai Quality Appreciation Award. Dubai Courts (Government sector), AW Rostamani Group (Trade sector), Union National Bank (Finance sector), Al Ain Hospital and Corniche Hospital from (Healthcare sector), received the Dubai Human Development Award, while Network International (Finance sector), Al Gharbia Hospitals (Healthcare - Hospitals), Aster Pharmacy Group (Healthcare - Pharmacies), British Orchard Nursery - Dubai Silicon Oasis Branch (Education sector) and Thumbay Group (Service sector) received the Dubai Human Development Appreciation Award. Ahmed bin Mohammed bin Rashid Al Maktoum honoured the 18 Best Service Performance Brands from the participants in the Dubai Service Excellence Scheme during 2017. The winners were: Arabian Automobiles - Nissan (Automobile Showroom), Eros Electricals (Electronics), The Bagel Bar Coffee House (Café), Pure Gold Jewellers (Jewellery), National Bonds Corporation (Contact Center), National Bank of Ras Al Khaimah (Banking Services), Al Fardan Exchange (Money Exchange Services), Dnata Travel Services (Travel Services), aafaq Islamic Finance (Services), Danube Home (Furniture), Al Jaber Optical (Opticals), Life Pharmacy (Pharmacies), India Palace Restaurant (Restaurant), Springfield (Clothing), Nine West (Footwear), The Face Shop (General Retail), Global Village (Leisure & Entertainment), and aswaaq (Hypermarket). Three winners among DSES participants who introduced the Happiness Metre initiative in their outlets were awarded by Sheikh Ahmed bin Mohammed bin Rashid Al Maktoum. The winner with the highest overall happiness index score was Arab Bank for Investment & Foreign Trade (Al Masraf), while the winner of the highest number of happiness metre votes received from customers was aafaq Islamic Finance. Dubai Islamic Bank (Widest implementation of Happiness Meter), was also a winner. 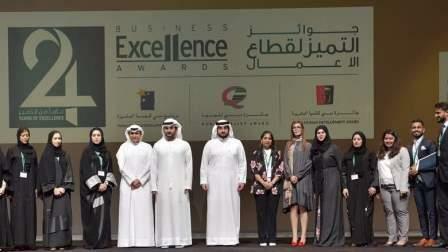 "The winners of the Business Excellence Awards represent a measure of organisational performance and a catalyst in the race towards excellence, further development and prosperity," said Sami Al Qamzi, director-general of DED, said adding that the success of Dubai's quality and excellence journey depends on productive public and private sectors. Dr Vandana Gandhi, founder and CEO of British Orchard Nursery chain, said to bag four awards, two for quality and two for human development, on the same day is indeed a glorious achievement.